The Gatlinburg and Pigeon Forge area of the Smoky Mountains puts on a fabulous light show each Christmas, with many millions of lights to see, marking the time of Winterfest and Winter Magic. From driving tours through the towns to stage shows to spectacular fireworks, there are plenty of opportunities for you to get in the holiday spirit and see millions of lights in the Smokies this season. As well as the towns themselves decked out with millions of lights, these other noteworthy light displays and shows are some of the most popular Christmas celebrations in the area. It should come as no surprise that Dollywood goes all out to celebrate the Christmas season. The park is decked out in approximately 4 million lights for guests to enjoy as they explore everything it has to offer. One of the centerpieces of the Dollywood Christmas festival is its gigantic, lighted Christmas tree, as well as the nightly Parade of Many Colors that features lighted floats, characters, and lots of dazzling surprises. For several years now, the Christmas show at Dolly Parton’s Stampede in Pigeon Forge has been one of the can’t-miss attractions for visitors during the holiday season. This exciting production treats viewers to millions of twinkling LED lights, beautiful Christmas ornaments, and plenty of holiday cheer to get you ready for the season. Toys will spring to life, you’ll witness a dramatization of the birth of Jesus Christ, and performers will dazzle in this exciting show. The Island at Pigeon Forge is one of the most popular shopping, dining, and entertainment destinations in the Smokies, and they celebrate the holiday season in style. This huge observation wheel will that towers above the area will be decked out in lights again this year. And while you can check out the Island Fountain Show during any season of the year, it gets even better during Christmastime. Check out the Fountain Show’s 500,000 lights and three Christmas trees, and then cap off the evening by dining or browsing the stores. Shadrack’s Christmas Wonderland will transport you to a Christmas spectacle with its creative light and sound displays. You will meander through the amazing lights in your own car, so every member of the family can tag along (even your furry friends). Shadrack’s is truly one of the most anticipated events of the season for locals and visitors alike. 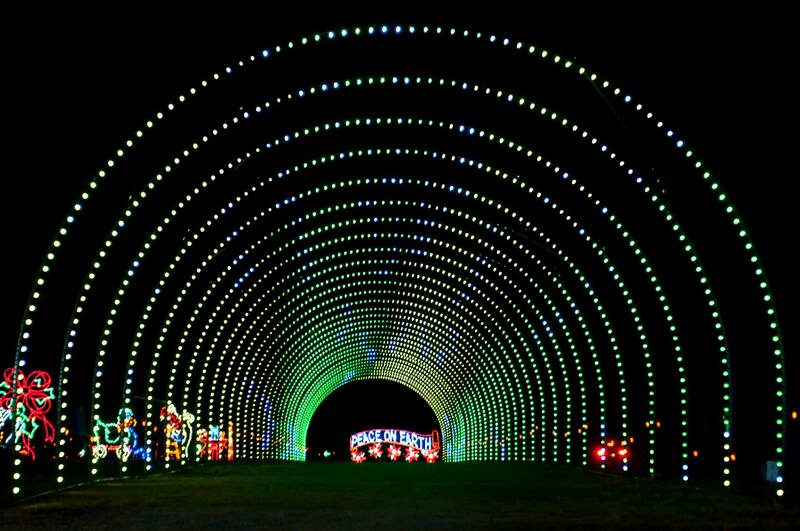 On your drive to Shadrack’s Christmas Wonderland, you can also take some time to see the stunning lights in Sevierville on the way. If parades are more your style, the Gatlinburg Fantasy of Lights Parade will delight you with an abundance of holiday spirit. This festive event features numerous floats all decked out in their finest lights, the sounds of local marching bands, and even an appearance by Old St. Nick. This year’s iteration will be held on December 1 at 7:30 PM in downtown Gatlinburg, but you’ll want to grab a spot early because it will fill up quickly. Just because Christmas has to end doesn’t mean the lights have to go out in the Smokies. All across the region fireworks will light up the sky on the night of December 31. If you’re in Gatlinburg you can check out the New Year’s Eve Fireworks and Ball Drop Show at the base of the Space Needle. Also, the Island at Pigeon Forge hosts its own fireworks extravaganza that night. No matter how you choose to see the lights of the Smokies this holiday season, they’re all just a short drive from your Gatlinburg or Pigeon Forge cabin.